Edmund Duckworth grew up as the older of two sons in a middle class family during the Great Depression. 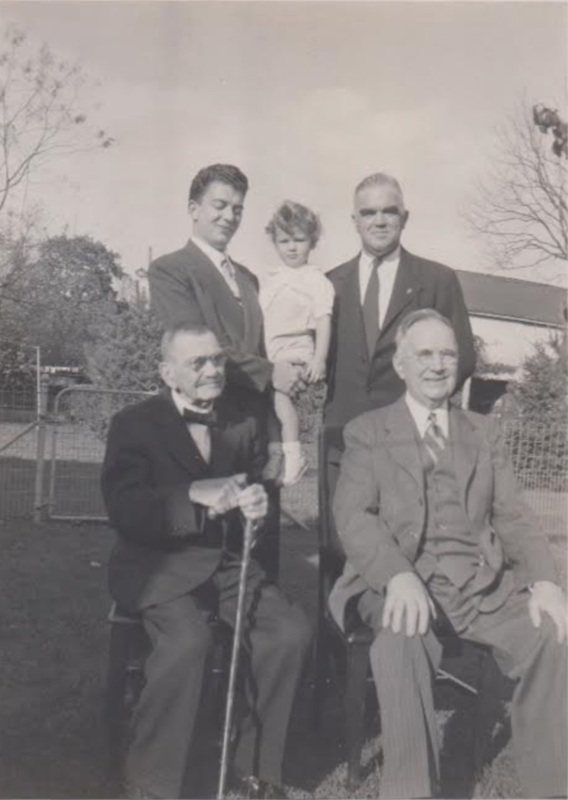 His father, Leon, worked as the Superintendent of Lancaster Waterworks, and his mother, Irene, stayed home and took care of their children: Edmund, called Bill, and James, called Jim. Leon served on a Navy destroyer in World War I, and after the war both he and his wife were active in the American Legion. As a result, both Edmund and Jim were members of the Sons of the American Legion and became involved in the Citizens Military Training Corps (CMTC), a predecessor to the Reserve Officers’ Training Corps (ROTC). Edmund attended Manheim Township High School in Lancaster, Pennsylvania and graduated in 1939. During his free time he loved to dance. He competed in jitterbug competitions at local movie theaters between movie showings, many of which he won. Edmund attended Elizabethtown College for a semester in the 1940-1941 school year, where he studied business. He left school to enlist in the U.S. Army on February 4, 1941. While training in England for the Normandy invasion, Edmund met his future wife, Audrey Travers, of Bridgeport, Dorset, England. The two were married on June 1, 1944, just five days before his death. Their son, Patrick, was born on December 24, 1944. Audrey and Patrick moved to the United States in 1946 and lived the rest of their lives there. Patrick died in 1995, and Audrey died in 2001. They are both buried in Salisbury, Maryland. Pennsylvania was the “Arsenal of America” during World War II. Pennsylvania factories manufactured planes, tanks, armored cars, guns, and shells. Manufacturing centers in the Philadelphia, Pittsburgh, and Erie areas built and launched millions of tons of shipping for America’s Armed Forces. Additionally they produced oil, coal, steel, and crops to feed both workers and soldiers. Forty military installations across the state including two large camps, Indiantown Gap and Camp Reynolds, helped prepare soldiers for the war effort. All Army doctors received training at Carlisle Barracks. German prisoners of war lived near the Lancaster area. Lancaster participated in the war effort through scrap drives that collected vital materials such as metal, rubber, and paper. Lancaster’s farms provided food for soldiers and civilians alike. The local government sold war bonds and issued rations, children joined the Victory Corps program at their schools, and victory gardens were grown at homes across the county. Many Lancaster-based companies also contributed to the war effort. Armstrong Cork Company produced shells, airplane fuselages, bomb racks, and camouflage netting among other supplies. Hamilton Watch Company made marine chronometers, air force watches, and map measuring tools. The Navy also established a plant operated by the Radio Corporation of America (RCA) to make electronic devices. 1,171,127 Pennsylvanians served in World War II, which puts it second only to New York in the total number who served. From Lancaster County over 21,000 served, 1,948 of whom were killed, wounded, missing, or taken prisoner by the end of the war. Starting in 1937, Duckworth spent three consecutive summers in Virginia Beach training with the Citizens’ Military Training Camp. On February 4, 1941, Duckworth enlisted in the U.S. Army in Harrisburg, Pennsylvania. His prior experience working as a clerk aided him in earning rapid promotions. By late 1941, he had achieved the rank of sergeant in the Baltimore Recruiting Office. However, Duckworth wanted a more active role in the war so he requested a transfer to Officer Candidates’ School at Fort Benning, Georgia, where he graduated as a Second Lieutenant in 1942. He was assigned to the 1st Infantry Division, 16th Infantry Regiment, Company E on September 1, 1942. Duckworth served in three different campaigns with the 1st Infantry Division, first in North Africa, then in Sicily, and finally in Normandy. Their operations in North Africa began on December 28, 1942, as part of Operation Torch. On April 28, 1943 Duckworth gallantly assumed command of his unit when his commanding officer was wounded in Mateur, Tunisia. He was awarded the Silver Star for his actions. By July 1943 the 1st Infantry Division had moved to Sicily and participated in Operation Husky. On August 3, 1943, Duckworth was serving as Company E’s Communications officer in Troina, Sicily when he crawled over terrain, exposing himself to enemy fire during battle in order to repair communication lines that had been severed. 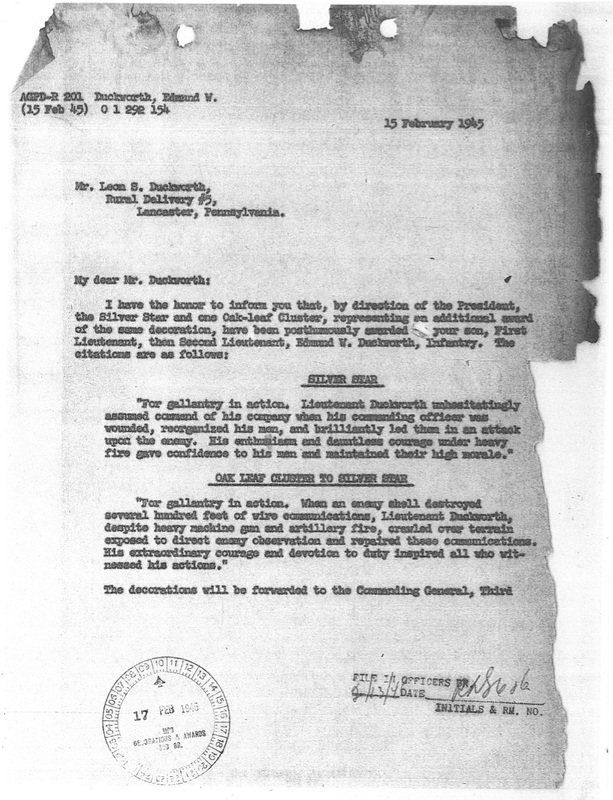 First Lieutenant Duckworth was awarded the Silver Star posthumously for his actions on that day. On October 23, 1943, the 1st Infantry Division departed for England to prepare for the Normandy Invasion. They arrived on November 5, 1943. The Normandy Invasion was First Lieutenant Duckworth’s third campaign with the 1st Infantry Division. On the morning of June 6, 1944, Company E of the 16th Infantry Regiment was in the first waves of the invasion on Omaha Beach. Company E was one of the few units involved in the initial invasion who had previously seen combat. However, this made little difference as strong tides and rough waves caused many landing craft to drop their men far from their targeted landing zones. Company E ended up intemingled with companies from the 116th Infantry Regiment, leading to further chaos. There was also a lack of support from DD tanks due to the rough weather conditions. When combined with the failure of the aerial bombing to take out enemy strong points on Omaha Beach, the German crossfire was made all the more deadly. It was there, pinned down on the beach, that Duckworth shared a drink with his comrades shortly before he was killed by enemy fire. Duckworth was initially buried in the temporary cemetery at Saint-Laurent-sur-Mer in Plot B, Row 2, Grave 31 . His remains were later transferred to the Normandy American Cemetery located in Colleville-sur-Mer, France where he was permanently laid to rest in Plot I, Row 19, Grave 12. In his famous 1962 book, The Longest Day, Cornelius Ryan described the untimely death of a brave young soldier who left his new bride behind as he gave the ultimate sacrifice for freedom. “In the cathedral-like atmosphere of the Westminster Bank at Bridgeport in Dorset, Audrey Duckworth was hard at work and didn’t hear about the assault until much later in the day. It was just as well. Her American husband, [First Lieutenant] Edmund Duckworth of the 1st Division, had been killed as he stepped onto Omaha Beach. They had been married just five days.” However, Mr. Ryan got many details wrong in his account of this American officer’s death. 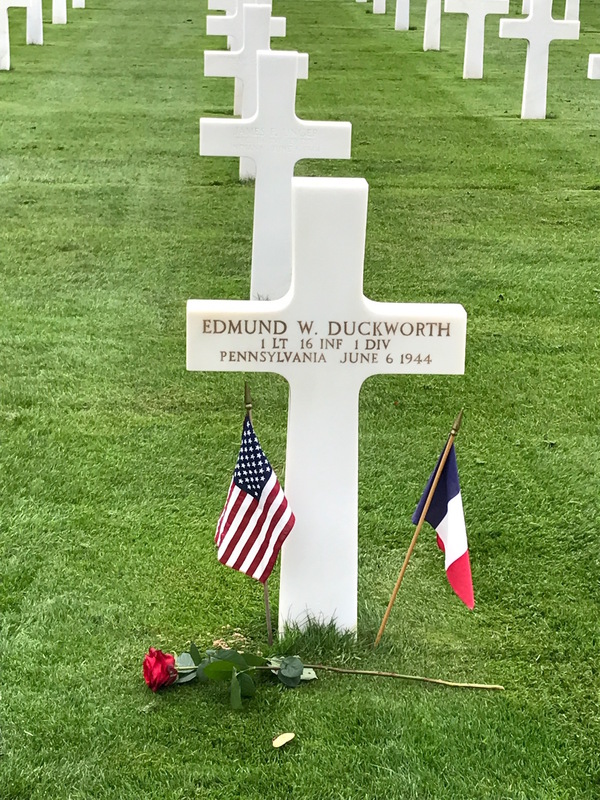 First Lieutenant Edmund Duckworth made it onto the sands of Omaha Beach only to be pinned down in an anti-tank trench with his comrades from Company E, 16th Infantry Regiment of the 1st Infantry Division. A sniper killed him. But Lieutenant Duckworth’s story needed none of the Hollywood embellishment given by Ryan, because his story is a remarkable tale in its own right. First Lieutenant Edmund Duckworth was accustomed to being under fire. He served in three different campaigns with the 1st Infantry Division. He was awarded the Silver Star twice. On the morning of June 6, 1944, Lieutenant Duckworth somehow managed to have the nerve to share a drink with his comrades while pinned down by enemy fire on the beach. 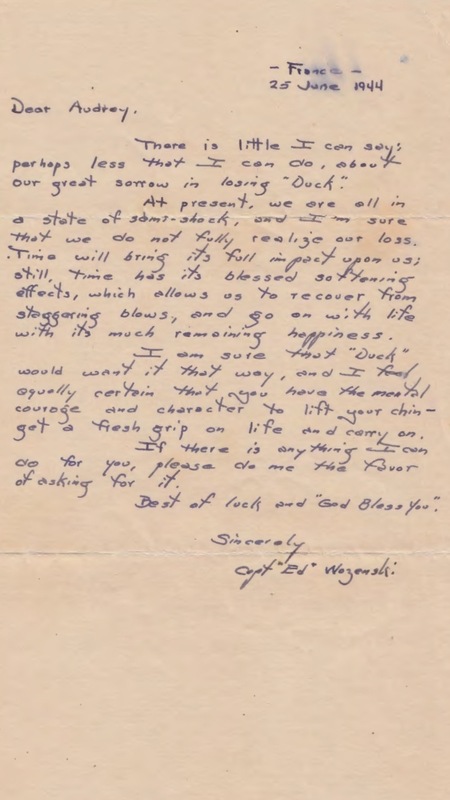 Yet the reality of what he would face on this beach on June 6 did not escape him, and he went as far as to write a goodbye letter to his brother just prior to the Invasion. First Lieutenant Duckworth enlisted in the U.S. Army on February 4, 1941, well before the rallying cry of Pearl Harbor. His great grandfather was the longest surviving Pennsylvanian Civil War veteran, his father served in the Navy in World War I, and his brother was in the Army Air Force in World War II. Sadly, of all these veterans, it was only Lieutenant Duckworth who did not get to enjoy the long life of peace his sacrificed earned. 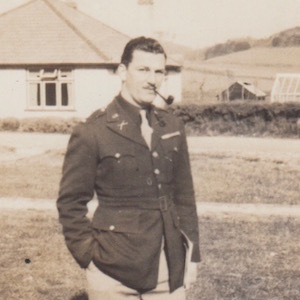 First Lieutenant Edmund Duckworth was clearly a dedicated soldier and countryman, yet he was also so much more. Known as Bill to his family and friends, and as Duck to his comrades, Lieutenant Duckworth was quite the character. His peers voted him to be a cheerleader during his brief time as a student at Elizabethtown College in 1940. He was also an amazing dancer, competing in jitterbug competitions between showings at movie theaters in his hometown of Lancaster before the war. And he swept a young English woman named Audrey Travers off her feet in 1944. 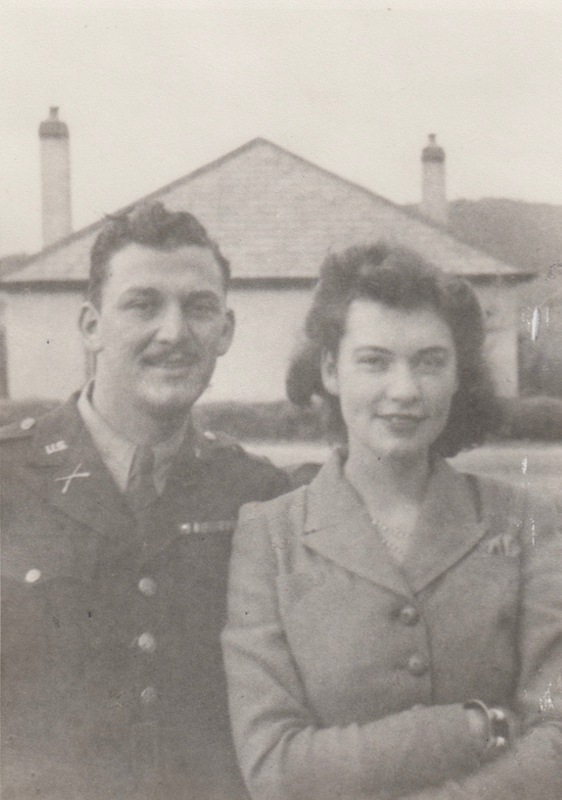 In fact, Lieutenant Duckworth married her just five days before his death here at Omaha Beach. In the end, everything he did boiled down to his never-satisfied attitude that drove and compelled him to aggressively go after what he wanted. Ultimately it was these qualities that made him a well-respected leader in Company E of the 16th Infantry Regiment. Before leaving on this trip, your granddaughter sent us a photograph that I treasure. It is of five living generations of Duckworth men. In it, your brother, Jim, is holding your son, Patrick. This photo, and this project, has truly put a human face on an event, D-Day, that defies the imagination. This photograph connects generations of people who enjoyed a life of peace and prosperity as a result of the bravery of soldiers here in Normandy and on other battlefields decades ago. I want to thank you, First Lieutenant Edmund Duckworth, for your sacrifice that allows us to stand here today. The Normandy: Sacrifice for Freedom® Albert H. Small Student and Teacher Institute provided me with an incredible opportunity to see where some of the most important events in recent history happened. For one, I know that I will never look at cemeteries or war memorials the same way again, and I have also gained an entirely new understanding of what it means to serve. The first site that really struck me was the Canadian Cemetery in Bretteville-sur-Laize. There was something so powerful about seeing the epitaphs that the families had chosen to put on their loved ones’ graves. It was one of our first stops, so it was the first time that the magnitude of what we were going to see hit me. I will never forget how I felt seeing the memorials for those who paid the ultimate price for our freedom. Another location that will stick with me forever is Omaha Beach. We went there early in the morning and stayed for an hour watching the tide come in, exploring, and reflecting. I remember climbing on top of the remnants of an old German strongpoint partway up a steep hill, looking out at the ocean, and wondering what it must have felt like to land on that beach the morning of D-Day. I still cannot fathom the amount of bravery demonstrated by all the soldiers who fought in the invasion of Normandy. The final place that we visited, and the one that had the greatest impact on me, was visiting the Normandy American Cemetery in Colleville-sur-Mer and listening to my peers give their eulogies. I know the experience of giving my eulogy is one I will never forget. I shook with emotion as I honored my silent hero, First Lieutenant Edmund Duckworth. The eulogies delivered by my peers honoring their Silent Heros stirred me just as greatly. I laughed and cried and grieved for those who had given everything and for those they left behind. I know this was an experience that I will always treasure, and I know that I have found someone, whom I will always carry in my heart: First Lieutenant Edmund Duckworth. American assault troops of the 3rd Battalion, 16th Infantry Regiment, 1st Infantry Division, carrying full equipment including a machine gun, move along a cliff on Omaha Beach, Colleville-sur-Mer at Normandy, France. Vast quantities of equipment, brought ashore from landing craft, lay at the base of the cliff. Photograph. June 6, 1944. National Archives and Records Administration (189922). American assault troops of the 3rd Battalion, 16th Infantry Regiment, 1st U.S. Infantry Division, assemble on a narrow strip at Omaha Beach before moving into the interior of the continent, near Colleville-sur-Mer, France. Additional infantryman disembark from landing craft on the right. Photograph. June 6, 1944. National Archives and Records Administration (189935). Audrey and Patrick Duckworth Entry; SS Zebulon B Vance, February 22, 1946; New York Passenger Lists, 1897-1957, Microfilm Serial T715, Microfilm Roll 7066, Line 13, Page Number 43, Ancestry, Accessed August 15, http://www.ancestry.com. “British Parents Are Visiting Daughter Here.” The Daily Times (Salisbury, Maryland), November 15, 1976. https://www.newspapers.com/image/39769848. “C. H. Duckworth, GAR Vet, Dies.” The Philadelphia Inquirer, April 12, 1949. http://www.newspapers.com/image/172253151. “Cheerleaders Named at Elizabethtown.” Harrisburg Telegraph, November 10, 1939. https://www.newspapers.com/image/43025826. Citation for War Department Distinguished Unit Citation 16th U.S. Infantry Regiment 1st U.S. Infantry Division, July 1944-December 1944; World War II Operations Reports, 1940-48, Records of the Adjutant General’s Office, Record Group 407 (Box 5249); National Archives at College Park, College Park, MD. Company “E” 16th Infantry, July 1943-September 1943; World War II Operations Reports, 1940-48, Records of the Adjutant General’s Office, Record Group 407 (Box 5233); National Archives at College Park, College Park, MD. Company “E” 16th Infantry, June 6, 1944; World War II Operations Reports, 1941-48, Records of the Adjutant General’s Office, 1917-, Record Group 407 (Box 19023); National Archives at College Park, College Park, MD. Duckworth, James. Telephone interview with Lauren Miller. May 23, 2017. Duckworth Family Photographs. 1944-1995. Courtesy of Andrea Wojick. Edmund W. Duckworth, Individual Deceased Personnel File, Department of the Army. Edmund W. Duckworth, Official Military Personnel File, Department of the Army, RG 319, National Archives and Records Administration - St. Louis. Civil Registration Birth Index. England and Wales. January, February, and March 1945. Digital Images. Ancestry.com. Accessed August 15, 2017. http://www.ancestry.com. Civil Registration Marriage Index. England and Wales. April, May, and June 1944. Digital Images. Ancestry.com. Accessed August 15, 2017. http://www.ancestry.com. Eunison, Robert. “Junk Dealers Replace GI’s on Beaches of Normandy.” The News (Frederick, Maryland), June 6, 1949. https://www.newspapers.com/image/8842854. “Five-Generation Family Reunion.” The Philadelphia Inquirer, January 5, 1947. https://www.newspapers.com/image/172268056. “Freshmen Hear First Lecture.” The Evening News (Harrisburg, Pennsylvania), September 14, 1939. https://www.newspapers.com/image/58472685. Headquarters 16th Infantry, April 8, 1944; World War II Operations Reports, 1940-48, Records of the Adjutant General’s Office, Record Group 407 (Box 5232); National Archives at College Park, College Park, MD. Headquarters 16th Infantry, July 9, 1944; World War II Operations Reports, 1940-48, Records of the Adjutant General’s Office, Record Group 407 (Box 5232); National Archives at College Park, College Park, MD. Headquarters 16th Infantry, December 4, 1943; World War II Operations Reports, 1940-48, Records of the Adjutant General’s Office, Record Group 407 (Box 5232); National Archives at College Park, College Park, MD. Headquarters 16th Infantry, February 7, 1944; World War II Operations Reports, 1940-48, Records of the Adjutant General’s Office, Record Group 407 (Box 5232); National Archives at College Park, College Park, MD. Headquarters 16th Infantry, May 9, 1944; World War II Operations Reports, 1940-48, Records of the Adjutant General’s Office, Record Group 407 (Box 5232); National Archives at College Park, College Park, MD. “Hero’s Dad Asks Truman Aid Kin.” The Philadelphia Inquirer, January 20, 1946. https://www.newspapers.com/image/171449101. “Hero’s Dad Asks Truman to Unite Kin.” The Philadelphia Inquirer, January 20, 1946. https://www.newspapers.com/image/171448949. History 16th CT Invasion of France S-3 Combat Report, June 6, 1944; World War II Operations Reports, 1940-48, Records of the Adjutant General’s Office, Record Group 407 (Box 5233); National Archives at College Park, College Park, MD. “Lancaster ‘In-Laws’ Greet War Widow and Her Baby.” The Philadelphia Inquirer, February 23, 1946. https://www.newspapers.com/image/171088634. Pennsylvania. Bucks County. 1880 U.S. Federal Census. Digital Images. Ancestry.com. http://www.ancestry.com. Pennsylvania. Bucks County. 1900 U.S. Federal Census. Digital Images. Ancestry.com. http://www.ancestry.com. Pennsylvania. Bucks County. 1910 U.S. Federal Census. Digital Images. Ancestry.com. http://www.ancestry.com. Pennsylvania. Lancaster County. 1920 U.S. Federal Census. Digital Images. Ancestry.com. http://www.ancestry.com. Pennsylvania. Lancaster County. 1930 U.S. Federal Census. Digital Images. Ancestry.com. http://www.ancestry.com. Pennsylvania. Lancaster County. 1940 U.S. Federal Census. Digital Images. Ancestry.com. http://www.ancestry.com. Wojick, Andrea. Telephone interview with Lauren Miller. April 26, 2017. World War II Grave Registrations. St. Laurent-sur-Mer, France. Map. National Archives and Records Administration (3582). “1861-1945: Era of Industrial Ascendancy.” Pennsylvania Historical and Museum Commission. Last modified August 26, 2015. Accessed July 26, 2017. http://www.phmc.state.pa.us/portal/communities/pa-history/1861-1945.html. Ambrose, Stephen E. D-day June 6, 1944: The Climactic Battle of World War II. New York: Touchstone, 1994. CWGC/ABMC. “1Lt Edmund W Duckworth.” Find A Grave. August 8, 2010. Accessed August 15, 2017. https://www.findagrave.com/cgi-bin/fg.cgi?page=gr&GRid=56644089&ref=acom. “Edmund W. Duckworth.” American Battle Monuments Commission. Accessed July 27, 2017. https://abmc.gov/node/415401#.WXqV8xiZO1s. Klein, Frederic Shriver. Lancaster County Since 1841. Lancaster: The Lancaster County National Bank, 1955. Lefebvre, Laurent. “American D-Day.” Accessed August 15, 2017. http://www.americandday.org/. Loose, John Ward Willson. The Heritage of Lancaster. Woodland Hills: Windsor Publications, 1978. McManus, John C. The Dead and Those About to Die: D-Day: The Big Red One at Omaha Beach. New York: Penguin Group, 2014. “Roll of Honor.” 16th Infantry Regiment Historical Society. Accessed August 15, 2017. http://www.16thinfantry.com/faces-of-the-16th/roll-of-honor/#D.